Graham Landscape and Design LLC designs, installs, and maintains residential and commercial landscapes in Coburg Oregon. Pictured to the right is a permeable paver driveway designed and installed by Graham Landscape and Design LLC in Coburg Oregon. The Problem: Coburg has special restrictions on the proportion of impervious (does not allow water to pass through to the ground) surface area to the pervious (allows water to pass through to the ground) surface area of each building lot. 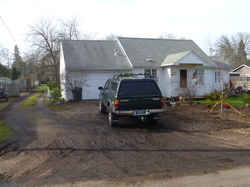 This homeowner in Coburg Oregon desired a driveway that did not turn to mud each winter. The problem was that the house footprint already consumed the majority of impervious area of the building lot was allowed. A concrete driveway was not able to be permitted, because concrete is an impervious surface and water runs off rather than allowing water to drain through. The Solution: Graham Landscape and Design LLC created a solution to this problem by recommending and designing a permeable paver driveway. Because permeable pavers allow rainwater and stormwater runoff to pass through the surface and return to the natural aquifer, this solution was acceptable to the City of Coburg landscape planner. 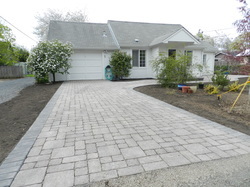 Graham Landscape and Design LLC was even able to extend these pavers to create a paver landing, paver patio, and paver walkway to complement the home without exceeding the impervious surface area proportion of the property. Graham Landscape and Design LLC prepped the area by excavating approximately 18" of soil. We overbuild our driveways to make sure they can withstand the test of time and vehicle weight. We then laid a heavy-duty woven geotextile fabric used on roads and highways. This keeps the imported gravel from mixing with the native soil. Permeable pavers require an "open" gravel "reservoir" vs. a "minus" gravel typically used on paver installations. We imported the open gravel and compacted it with a special vibratory compactor and then we laid a "crushed" gravel on top of this reservoir to ensure that the base was stable. Then, we laid the pavers and filled the joints with a smaller open gravel to allow water to pour through the joints. 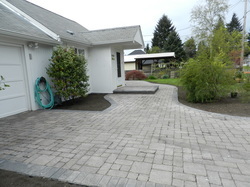 Permeable pavers have special joint spacing to allow a larger quantity of water to drain through the paver application. Now this homeowner can wash their vehicle without concern of oil, soap, or other chemicals washing into the City of Coburg stormwater system. They also do not have to deal with the muddy mess their gravel driveway turned to each winter.